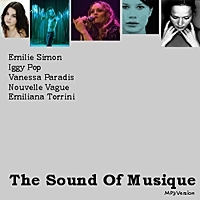 And now... on with our next EP - The Sound Of Musique. As someone recently quite aptly said on the internet, "The Sound of Musique - you'll find rare songs, weird covers, alternative versions, remixes and new artists." So, for the adventurous here are four covers that are off the beaten path. Come As You Are - Emilie Simon. Emilie Simon might be better known as the composer of the soundtrack to the French version of March of the Penguins but here she is doing a live version of Nirvana's Come As You Are in Paris at the L'Olympia reputedly in 1993. Don't Smoke In Bed - Iggy Pop and Vanessa Paradis. Mrs Johnny Depp and Iggy the crooner - and the result doesn't disappoint. Most likely taken from the bootleg DVD, Nightclubbing In Paris (December 12, 1999). Relax - Nouvelle Vague. Nouvelle Vague, whose members once included singer Camille, are noted for their covers of '80s songs in the bossa-nova style. Because of the release of Camille's solo album, Le Fil, she was dropped from Nouvelle Vague's second album, Bande à part. Here is her unreleased version of Frankie Goes To Hollywood's Relax. The Sound of Silence - Emiliana Torrini. Emiliana Torrini will probably always be compared to Bjork since both are from Iceland. She used to be in the group Gus Gus, dabbled in electronica and is known for her 1999 album, Love In The Time Of Science. This track is from her hard-to-find 1996 release, Stone Free. Click on the highlighted tracks to download the MP3s (these are high quality, stereo MP3s - sample rate of 192 kibit/s). Click here for the Sound of Musique to find out more.